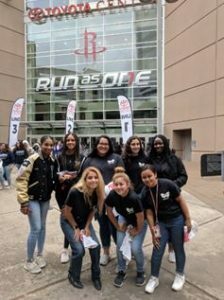 In case you missed it – Here’s a recap of results from some of our Falcons sports teams from the week of 3/25/19. Want your team highlighted on the athletic website? Send sports scores, game summaries, and photos to webmaster.fosterabc@gmail.com. March was National Athletic Trainer Month. On behalf of all the Foster athletes and coaches THANK YOU to our Athletic Trainers and Student Athletic Trainers for everything you do to keep us Foster Strong! The Foster Boys are The Ben Garcia Memorial tournament champions! The boys defeated Strake Jesuit 14-11 to win the title. Great job boys! 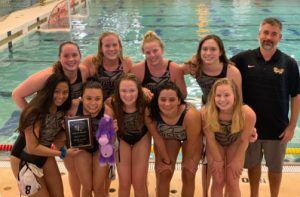 The Foster Girls are Ben Garcia Memorial tournament champions! They were able to hold off St Agnes after they made a strong 4th quarter comeback. Congratulations ladies! Congratulations Aiden! Freshman A Boys Singles consolation round winners! Congratulations Miguel and Lyle! Champions Freshman A Boys Doubles! Congratulations Ricky! 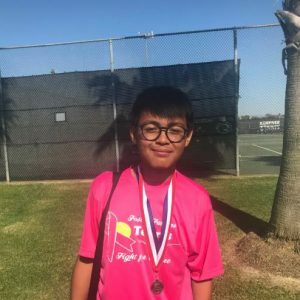 Champion JV A Boys Singles! 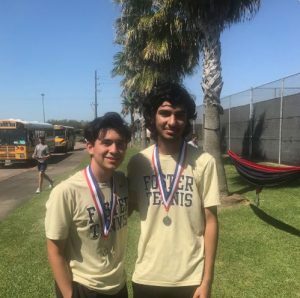 Congratulations Hussein and Ian 2nd JV A Boys Doubles! 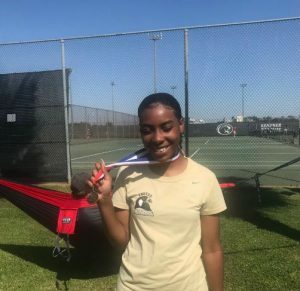 Congratulations Aalaila! Champion Freshman B Girls Singles! Congratulations Marc! 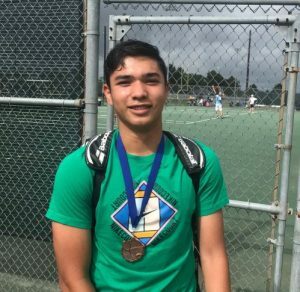 JV Boys B singles consolation round winner. Congratulations Laurence! 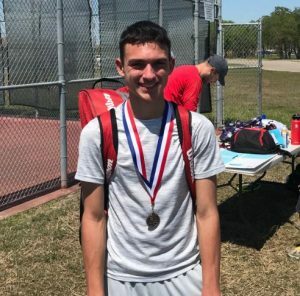 A Boys Singles Consolation round winner at Klein! Congratulations Kali! 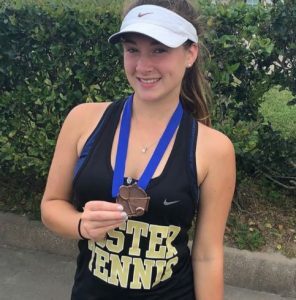 A Girls Singles Consolation round winner at Klein! Congratulations Joseph! 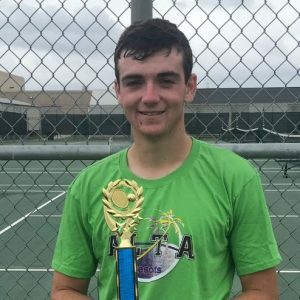 A Boys Singles Champion at Klein! Congrats to the Foster Falcon girls golf team for winning the district 24-5A tournament! Sophomore Samantha Vesey also finished 2nd as an overall individual. Great job ladies! On to regional’s! Varsity played hard but falls short 2-1. Randy Bolanos with the goal for Foster. Thanks for a great 4 years seniors! JV won all 3 games vs. Bryan, Aldine, and Mayde Creek in the JV tournament. 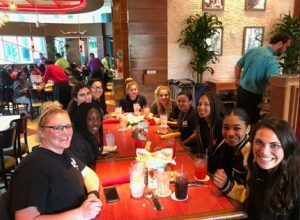 Congrats to Coach Macek and her squad! Foster weathered a push by Lamar in the third inning where Foster coughed up three runs, but Foster still won 14-3 on Tuesday. Foster tallied four runs in the fourth inning. Foster offense in the inning was led by Kylie Neel, Kylie Williams, and Shelby Showers, all knocking in runs in the inning. Peyton Welker led things off on the rubber for Foster. She surrendered three runs on three hits over two and two-thirds innings, striking out two. Foster launched one home run on the day. Cici Mata went deep in the sixth inning. Foster tallied 13 hits in the game. Neel, Mata, Alyssa Muceus, and Kylie Stamper all managed multiple hits for Foster. Neel went 4-for-4 at the plate to lead Foster in hits. 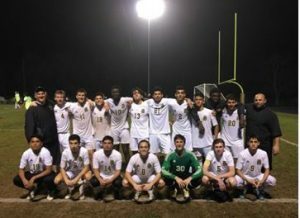 Foster defeated Tompkins 6-1 on Thursday. In the first inning, Foster got their offense started when Kylie Neel doubled on a 1-0 count, scoring one run. Amanda Allen led things off in the pitcher’s circle for Foster. She surrendered one run on three hits over three innings, striking out three and walking zero. Kylie Stamper went 2-for-3 at the plate to lead Foster in hits. A walk-off left Foster on the wrong end of an 11-10 defeat to Calhoun on Thursday. Calhoun was down 10-9 in the bottom of the sixth inning when an error scored two runs for Calhoun. Foster fell behind by five runs in the second inning, but then tried to fight back. Foster scored eight runs in the failed comeback on a double by Sierra Toman in the third, a single by Kylie Stamper in the fourth, a triple by Kylie Neel in the fourth, a double by Toman in the fourth, a sacrifice fly by Alexis Morin in the fifth, and a triple by Neel in the sixth. Foster knotted the game up at nine in the top of the fifth inning. Morin’s sac fly scored one run for Foster. Foster notched five runs in the fourth inning. Foster batters contributing to the big inning included Stamper, Neel, and Toman, all sending runners across the plate with RBIs in the inning. Foster tallied 11 hits. Neel, Stamper, and Toman all managed multiple hits for Foster. Neel led Foster with three hits in four at bats. 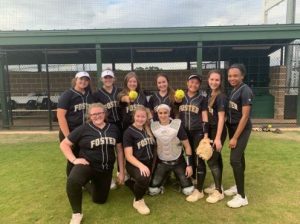 Foster JV Gold cruised to an easy victory over Shadow Creek 7-1 on Tuesday, notching three runs in the sixth inning. Brett Bermudes was the winning pitcher for Foster JV Gold. He surrendered one run on one hit over three innings, striking out three. Diego Saenz threw two innings in relief out of the bullpen. Foster JV Gold tallied nine hits. Lee Kubosh and Bermudes each collected multiple hits for Foster JV Gold. Kubosh led FosterJV Gold with three hits in four at bats. 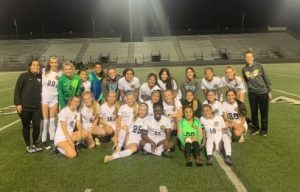 Foster JV Gold jumped out to an early lead over Shadow Creek and took home a 5-1 victory on Friday. Foster JV Gold scored on a stolen base by Lee Kubosh and a double by Dennis Everson in the first inning. 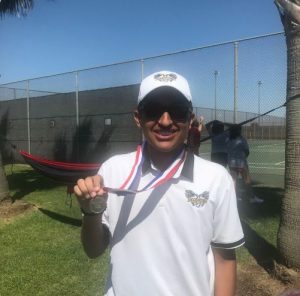 Luke Capel was credited with the victory for Foster JV Gold. He surrendered one run on five hits over six innings, striking out five. Wyatt Boyd threw one inning in relief out of the bullpen. 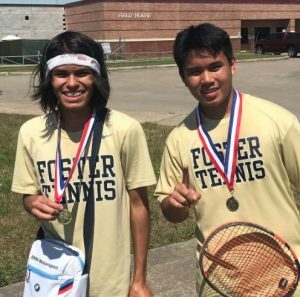 Foster JV Gold racked up eight hits. Everson and Brett Bermudes each collected two hits to lead Foster JV Gold. Foster JV Gold stole eight bases during the game as three players stole more than one. Bermudes led the way with two. Foster Falcons Varsity took Tuesday’s game in dramatic fashion, with a 3-2 walk-off victory over Shadow Creek. The game was tied at two with Foster Falcons Varsity batting in the bottom of the tenth when Reece Burke singled on a 0-2 count, scoring one run. The pitching was strong on both sides. Foster Falcons Varsity pitchers struck out ten, while Shadow Creek pitchers sat down 11. Foster Falcons Varsity fired up the offense in the first inning, when Zach Schroeder grounded out, scoring one run. Chase Albright pitched Foster Falcons Varsity to victory. He lasted two innings, allowing one hit and zero runs while striking out two and walking one. Cade Sitka started the game for Foster Falcons Varsity. He surrendered two runs on two hits over eight innings, striking out eight. Foster Falcons Varsity tallied eight hits on the day. Chance Van Cleave and Schroeder all had multiple hits for Foster Falcons Varsity. Van Cleave went 3-for-5 at the plate to lead Foster Falcons Varsity in hits. Shadow Creek fired up the offense in the first inning, when #10 hit a solo homer. Shadow Creek pulled away for good with three runs in the third inning. In the third #18 doubled on a 0-1 count, scoring two runs. Jackson Schwank took the loss for Foster Falcons Varsity. He lasted five innings, allowing seven hits and six runs while striking out two. Joseph Aventurado led Foster Falcons Varsity with two hits in three at bats. Congrats to the Lady Falcons JV TEAM on placing 3rd overall in District! 24-5A is arguably the toughest track district in the state in 5A and our girls came to COMPETE and gave it their all. 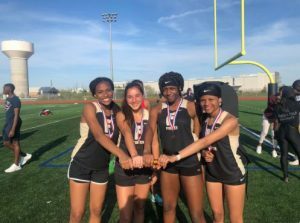 The 4×400 Relay of Nneoma Okpara, Yamila Mello Via, Anaya Ervin, and Isyss Wycoff get 3rd in District! 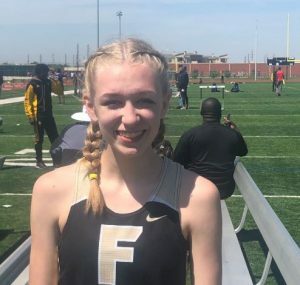 Congrats to Reghan Tullos on winning 3rd at District in the 100m Hurdles. 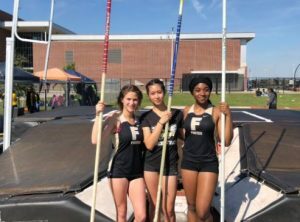 Clean sweep in Pole Vault! Congrats to Mya Tipton 3rd, Dana Nda 2nd, and your DISTRICT CHAMPION Judyan Cortez 1st! Clean sweep in High Jump! 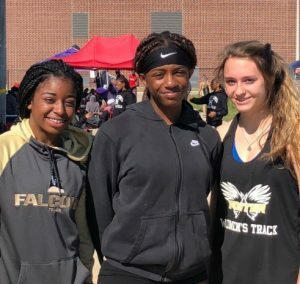 Congrats to Kylie Smink 3rd, Amariah Kendrick 2nd, and your DISTRICT CHAMPION ANAYA ERVIN 1st. Congratulations to Isabella Bibbs for her 3rd place finish in Discus!